9 night eco voyage, sailing from bustling Manila. 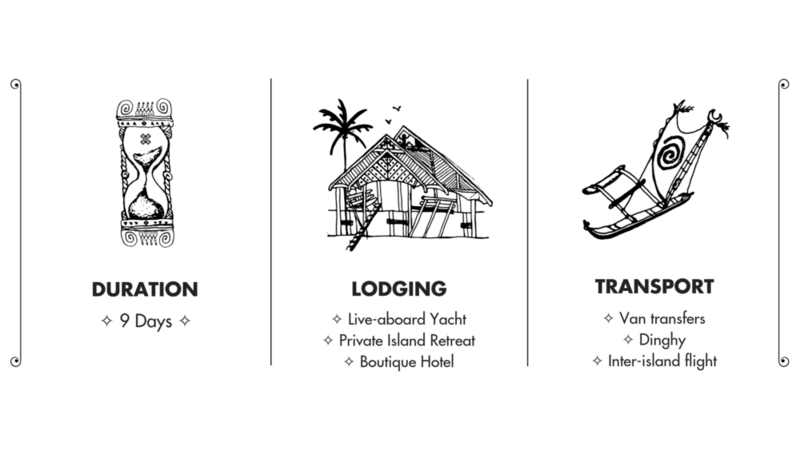 Inc. 4 nights sailing, visit uninhabited paradise islands to dive, harvest dinner and explore off-grid regions on an exclusive VOPO itinerary. 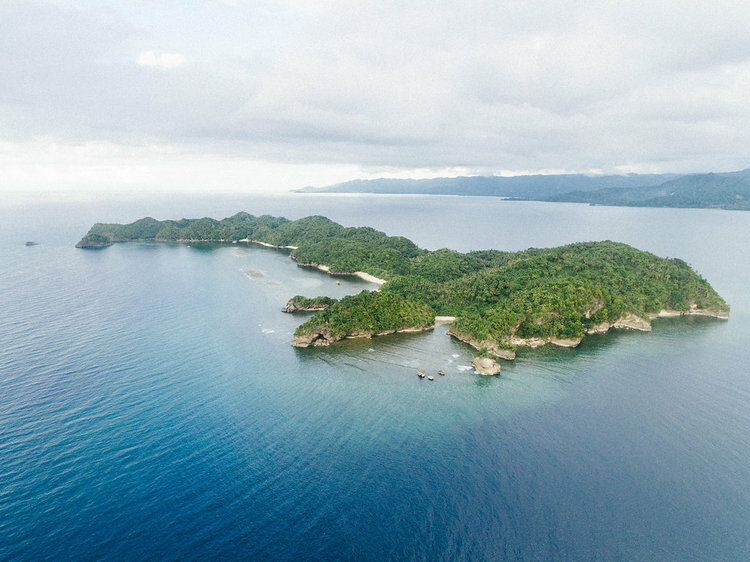 Arrive to our sanctuary home, Danjugan Island for a further 5 days of deep ecological immersion as you participate in the coveted EARTH Summit 2019. Uniting fascinating people from across the world. In the Philippines, Danjugan Sanctuary in particular, the thing you will notice first, the thing that stays with you, is the people. Perhaps the kindest and most inventive population we have ever met. When you get off the plane, you realise the good nature and intense past history that the people have lived through. You begin to understand the current socio-political landscape and the diversity in thought. We made sure to recognise this when selecting the various natural and cultural spectacles you encounter during the expedition. Expect to be surprised, past guests had no idea what was coming! Intense. Natural. And always real. If you are looking to discover the secret paradise of The Philippines archipelago, while contributing to exciting ecological projects, then this expedition is perfect for you. Say hello to Earth-class citizens of Philippines Expedition, March 2019. Are you a local Negros Island resident? Apply now for the Local Scholarship, sponsored by the incredible MODIBODI Australia. Spend 4 nights at Danjugan Sanctuary, including transport, accommodation, food and all eco-adventure activities. 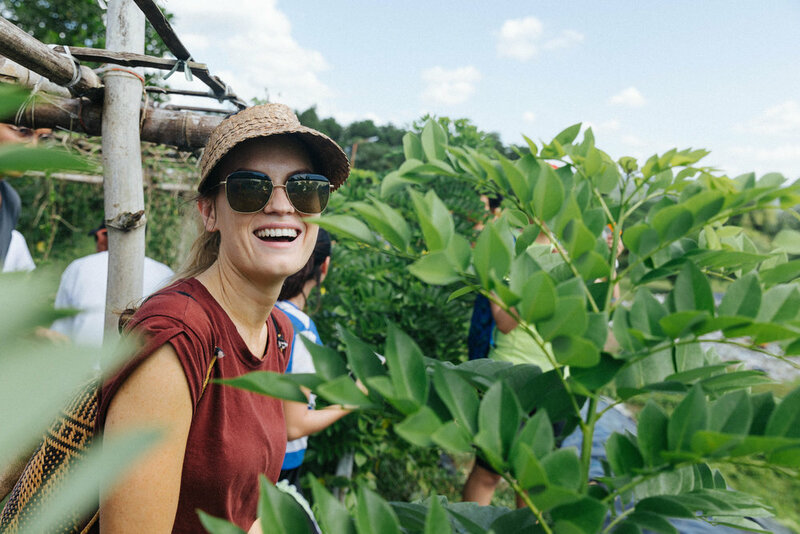 Enjoy a fully funded position, for all Wild Enterprise workshops and the EARTH SUMMIT! Thank you for making this opportunity possible, Modibodi. *Now closed, meet the finalists below! We need your help! Read through the below outstanding finalists (click their name to see more). Complete the voting form to assist with selecting the local Dumaguete, Philippines Scholar for EARTH VOYAGE 2019. The Scholarship program includes 4 nights at Danjugan Island Sanctuary with the VOPO Earth crew, all ecological activities & signature workshops. Plus, ongoing mentorship and global opportunities. At VOPO Earth, it is very important to us that equal opportunity exists. Regardless of the outcome here, all applicants will be invited and encouraged to engage in VOPO programs, events and opportunities that harness their brilliant potential. Thank you to VOPO Philippines sponsor partner, MODIBODI Australia for making this life-changing opportunity possible for ambitious Filipinos in one of the most economically challenged regions of the world. Voting closes Sunday, March 17 at 17:00PM AEST, with the winner announced publicly Monday evening. Who will be the VOPO Philippines MODIBODI Local Scholar 2019? How can The Philippines become a world leader in ecological preservation? “A great leader doesn’t tell you what to do, they show you how it’s done. A country can become a world leader in ecological preservation if the leaders themselves give priority to preserve our environment and have the initiative to educate the people and provide strictly enforced laws to protect and preserve our resources. The government itself should support the organisations whose aim is for a healthy environment. What are the 3 things you couldn’t live without on a remote island? I currently study BSBA Major Management Accounting at Foundation University. I also do graphic designing and play sports. I get myself involve in organisations whose aim is for sustainability and leadership. I am an Electrical Engineer and MBA Candidate at Silliman University. My additional experience includes Event and media management, Public relations and Team management. “For this country to become a world leader in ecological preservation, it must be through the conscious and collaborative efforts of each citizen of this country with the heart to protect and nurture the rich flora and fauna of the Philippines. It must begin by encouraging young individuals with bright and innovative ideas to cooperate with organisations that deliberately work on how we could further preserve our ecosystem. - Conduct researches to transform Philippines into a carbon-neutral country. In this digital age, one of the things to must-bring in a remote island is a smartphone, to capture such breath-taking sights, edit it minimally on some photo-editing apps, save it and share the moment on social media. It is also a necessity to bring comfortable clothings that is suitable for the different weather. Lastly, a personal hygiene kit for personal hygiene of course. I have a passion for volunteering most especially if it involves serving the humankind, animals, and protecting our environment. I love joining organisations that sets goal in nurturing our world in many different aspects. I also love to wander to unfamiliar places, it allows me to gain new learnings and treasure unforgettable moments and experiences. I have yet to discover more passion I have within me through many more experiences. I am the Internal Vice Pesident at NORSU League of Student Organizations. I study AB Social Sciences at Negros Oriental State University (NORSU) System and studied BS-Mathematics at University of the Philippines. I love talking to people. Seeing them smile makes me very happy! We need your help! Now complete the voting form to assist us with selecting the local Dumaguete, Philippines Scholar for EARTH VOYAGE March 2019. The Scholarship program includes 4 nights at Danjugan Island Sanctuary with the VOPO Earth crew, all ecological activities & signature workshops. Plus, ongoing mentorship and global opportunities. We need your help! Read through the below outstanding finalists (click their name to see more). Complete the voting form to assist with selecting the second local Dumaguete, Philippines Scholar for EARTH VOYAGE 2019. The Scholarship program includes 4 nights at Danjugan Island Sanctuary with the VOPO Earth crew, all ecological activities & signature workshops. Plus, ongoing mentorship and global opportunities. This scholarship was made possible by VOPO Earth team & partners, Danjugan Sanctuary. Thank you for making this life-changing opportunity possible for ambitious Filipinos in one of the most economically challenged regions of the world. Who will be the VOPO Philippines Danjugan Local Scholar 2019? I could not live without food, water and companion on a remote island. I might need to have a companion or someone who is more familiar with the geographical structure of a remote island because I might enter a red zone area. So it would be a great help to have a knowledgeable and experienced companion so that I could avoid unnecessary and dangerous encounters. I am passionate in advocating for the environment. It all started with just attending coastal clean-up activities as part of the advocacy of the student government that I am once part of. Until I was already attending different seminars, workshops and some talk sessions that allowed me to understand better the reality of the problem we are facing about the environment that's why I started a project that tackles both problems in unemployment and environment. The said project aimed to give livelihood to unemployed housewives by making them the makes of our products. Our products is a transformation of waste materials of bakeshops - the flour sacks - into tote and drawstring bags. With the said project, we aim to promote the responsible production of materials so that the unnecessary production of new fabrics are avoided. Hence, I can say that I am passionate on transforming problems into business solutions. Apart from physiological needs such as food and water, I believe that I cannot survive without a good book, pen and paper, and lastly, cozy socks. Hilarious as it may seem, I always carry with me a book, pen and paper wherever I go. Most of the time, I write happenings about my day to not forget about it for the rest of my year. Reading a good book can also pacify me if I were to be on a remote island alone. Lastly, cozy socks are my everyday buddy. When it’s chilly, it’s so lovely to pull on a pair of cozy socks—nestling in the snuggly softness is such a treat for our feet! At least if rescuers couldn’t find me and I won’t survive, I would spend my remaining days still lucky and delighted. I love writing. Ever since I was 8 years old, I always write about anything under the sun. Perhaps, that is also one of the reasons why I took Bachelor of Mass Communication in college. Through writing stories, I was able to integrate my personal advocacy in environmentalism. I love hiking mountains as well and I’ve been through Puncak Tanawan, Mt. Talinis, and Osmeña Peak. Because of my love for nature, I became a member of the Association of Young Environmental Journalists, a news network founded in Silliman University, which has been named as one of the Ten Accomplished Youth Organizations in the Philippines this year. Intertwined with this, I am keen on taking a stance on climate impacts to human health because I’m very particular on how our unwariness affect not just the environment we are living, but to us humans as a direct recipient. Mostly, people failed to see in this angle of environmental stewardship. That is why, I invest much time and effort through stories in making people realise this catastrophe as a human centric cause-effect relationship. Youth Advocate at 2030 Youth Force in the Philippines Inc.
I’m a biology student. I finished working on my thesis about micro-plastic occurrence in pelagic fish from southern Negros. I am an advocate against the usage of single-use plastic. I am currently working on myself and learning better alternatives. Also, I am the current president of our organisation, Cuernos de Negros Mountaineers Club Inc. It is a mountaineering org in which we aim to educate people on responsible mountaineering, or basically responsible travelling. I am very passionate about our mountains and seas. Who will be the VOPO Philippines, Danjugan Local Scholar 2019? eco-enterprise in the region. Savour the abundance, sharing a wild world with adventurers of diverse culture and skill. Grabe: The word comes from Spanish 'grave' and locally means serious, exceptional, extreme, too much!. Vedge Health Hub, delicious local filipino food cooked veggie and wholesome. VOPO Expeditions were conceptualised to address social and environmental challenges, by bringing skilled humans, adventurers & innovative minds together from across the world for an experience like no other. The itinerary is designed to connect, intellectually stimulate and inspire new ways of tackling some of the worlds biggest feats. All in a pristine setting with the wisdom of locals and curious company who are eager to dive deep, get exploring and bask in the glory of nature. Read our Sustainability Policy. As air travel is a huge contributor to environmental degradation, our team are currently focused on calculating our carbon footprint. For which, we have created Trading Carbon, an initiative that in allows us to neutralise the GHG emissions from all travel. We also respect our role as guests in each host country, knowing that long-term strong partnerships are imperative to sustainable outcomes and allow us to be responsive to the genuine goals of the region. VOPO also devote a portion of Expedition places to local scholarship participants, a measure that maximises accessibility. This is also key to our mission, exploring unintended consequences and addressing systems rather than symptoms. Additionally, we stay at locations that are off the grid, investing in local employment, with a commitment towards conservation and in harmony with nature. See the below survival guide for essential info. Or contact the team at info@vopo.earth. open your mind to what you can offer. see what magic the planet gives back to you. 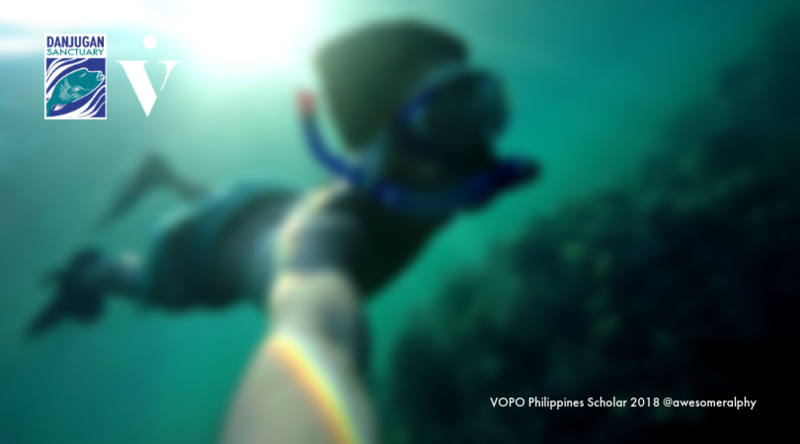 Help us select the local Dumaguete, VOPO Philippines Scholar for EARTH VOYAGE 2019. Thank you to VOPO Philippines sponsor partner, Modibodi for making this possible.